Abrupt climate change can create time-dependent temperature-depth profiles in initially thermally homogeneous temperate ice sheets. Fluctuations in average annual temperatures, occurring over time frames measured in decades or centuries, can change the character of glaciation in an already-glaciated area. The effects are fundamentally different depending on whether the climate change involves warming or cooling. Intervals of both abruptly warming climate conditions and abruptly cooling climate conditions punctuated the 5000 year deglaciation period immediately preceding the Holocene epoch. A rapidly warming climate will accelerate glacial melting and convert cold glaciers to temperate glaciers. However, a warming climate will not affect the temperature profile of bedrock underlying a temperate glacier. The temperature of such bedrock will always approximate 0 deg. C so long as the bedrock remains under warm-based glacial ice. Because it fosters a zero-gradient bedrock temperature profile, warming would not be expected to promote development of bedrock frost heave features. A rapidly cooling climate will drive a wave of declining temperature downward, converting temperate ice into cold ice and freezing previously unfrozen bedrock lying under thin glacial ice. The above charts show the impact of a step change in climate on a temperate glacier possessing insignificant included water. The illustrated theoretical climate change comprises an instantaneous drop of 10 deg. C in average annual temperature. Such instantaneous climate changes do not occur in nature but abrupt climate changes yielding 10 deg. C temperature adjustments (both warming and cooling) over decade-range time intervals have been inferred from ice core records (Note 1) of the pre-Holocene climate. As indicated in the above charts, it takes many years or centuries to drive cold conditions deep into a temperate glacier. The charts reflect the thermal diffusivity value for ice that is 100% frozen (see Ice Properties). When glacial ice includes a fraction of water at grain boundaries and in voids, the heat capacity is effectively increased and the thermal diffusivity declines, potentially significantly. 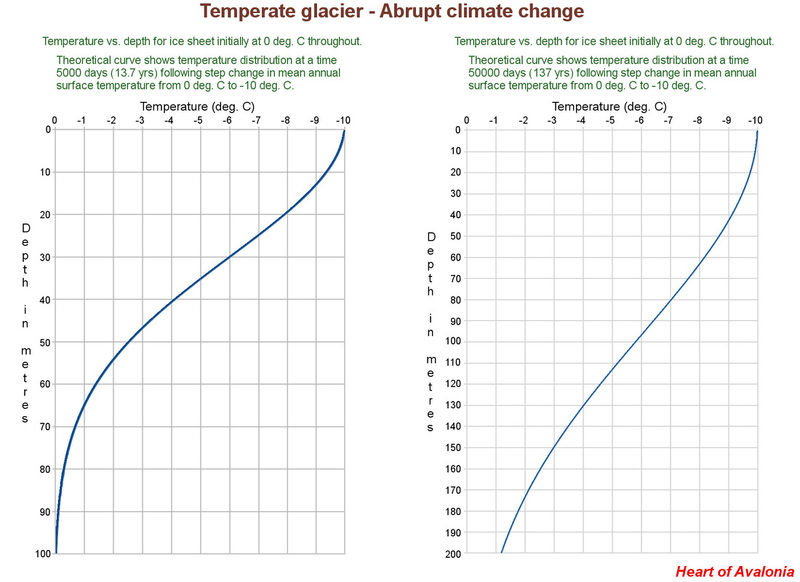 The above curves thus show a maximum rate of temperature decrease in a suddenly-cooled temperate glacier. The key result of the slowness with which a temperature change propagates downward through thick glacial ice is that polythermal glaciation is an inevitable and long-lasting consequence of suddenly cooling climate on a temperate ice sheet. The ice sheets overlying the Avalon Peninsula in the early stages of post-Wisconsin deglaciation were more than 300 m thick (see Regional Paleoclimate). As seen from the above charts, a sudden 10 degree drop in temperature would leave a 100 m thick temperate glacier with a warm (0 deg. C) base after 14 years and a 200 m thick glacier would cool just more than 1 deg. C at the base after 140 years. An accumulation of temperate ice 400 m thick would remain warm-based throughout the Younger Dryas stadial.